A covering for the head, consisting of false hair interwoven with or united to a kind of cap or netting. Wearing false hair on the head to supplement a scanty natural supply, or as an adornment, appears to have been a common custom among women in the Talmudic period. 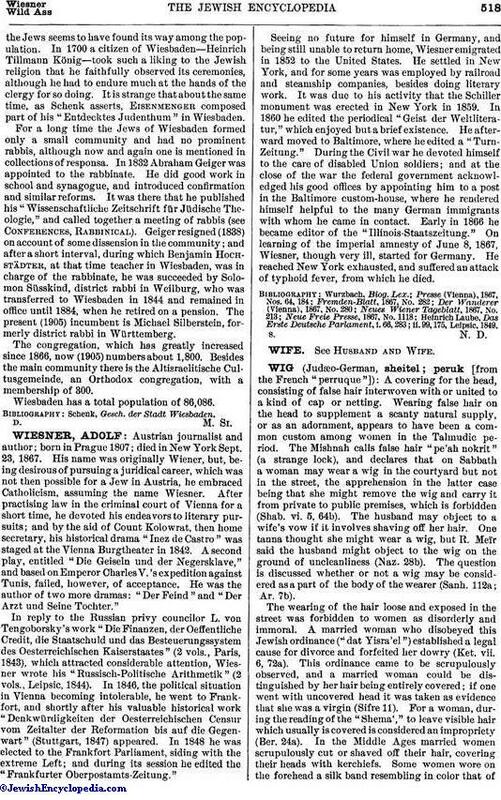 The Mishnah calls false hair "pe'ah nokrit" (a strange lock), and declares that on Sabbath a woman may wear a wig in the courtyard but not in the street, the apprehension in the latter case being that she might remove the wig and carry it from private to public premises, which is forbidden (Shab. vi. 5, 64b). The husband may object to a wife's vow if it involves shaving off her hair. One tanna thought she might wear a wig, but R. Meïr said the husband might object to the wig on the ground of uncleanliness (Naz. 28b). The question is discussed whether or not a wig may be considered as a part of the body of the wearer (Sanh. 112a; 'Ar. 7b). The wearing of the hair loose and exposed in the street was forbidden to women as disorderly and immoral. A married woman who disobeyed this Jewish ordinance ("dat Yisra'el") established a legal cause for divorce and forfeited her dowry (Ket. vii. 6, 72a). This ordinance came to be scrupulously observed, and a married woman could be distinguished by her hair being entirely covered; if one went with uncovered head it was taken as evidence that she was a virgin (Sifre 11). For a woman, during the reading of the "Shema'," to leave visible hair which usually is covered is considered an impropriety (Ber. 24a). In the Middle Ages married women scrupulously cut or shaved off their hair, covering their heads with kerchiefs. Some women wore on the forehead a silk band resembling in color that ofthe hair. During the sixteenth century R. Judah Katzenellenbogen and R. David ha-Kohen of Corfu permitted a wig to be used under a cover (David ha-Kohen, Responsa, No. 90). Moses Alashkar permitted the side hair to be partly exposed (Responsa, No. 35). During the eighteenth and nineteenth centuries rich women wore wigs in various styles, more or less exposed. The "pe'ah nokrit" in the Mishnah was pointed out to prove the early custom, but the opponents of the innovation explained that the wig was covered, not exposed. R. Moses Sofer and his disciple Akiba Joseph were decidedly opposed to the wig ("Leb ha-'Ibri," pp. 129, 189, Lemberg, 1873). In modern times Orthodox Jewesses in eastern Europe wear wigs, while in the Orient they still don the kerchief that covers all the hair. In America some of the women immigrants wear the wig; but the newly married women have all discarded it and wear their natural hair in the prevailing style. There is nothing in rabbinical literature to show that wigs were ever worn by men, aside, perhaps, from the statements that the Roman legions carried scalps with them ("ḳarḳefet"), and that Ishmael's scalp adorned the heads of the kings (Ḥul. 123a). The scalps appear to have been used in battle to insure good fortune and victory; and it is possible they were used as wigs. 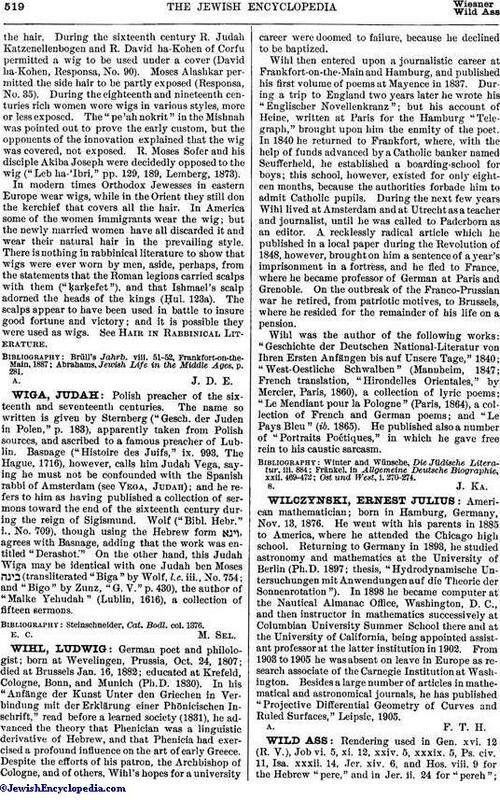 See Hair in Rabbinical Literature. Abrahams, Jewish Life in the Middle Ages, p. 281.